Did you see Abby's to-do list yesterday? Yes, she is her momma's daughter. I've been thinking a lot about lists lately. Mostly because I live by one. I recently tweeted "I'm drowning in my to-do list. Save me!" I don't think that is what they mean when they say "live in the moment". When I was grousing about this with a friend recently, she reminded me of Arnold Lobel's Frog & Toad Books, and one story in particular called "The List". I picked a couple of the books up from the library and have been reading the stories to my kids. They are priceless. 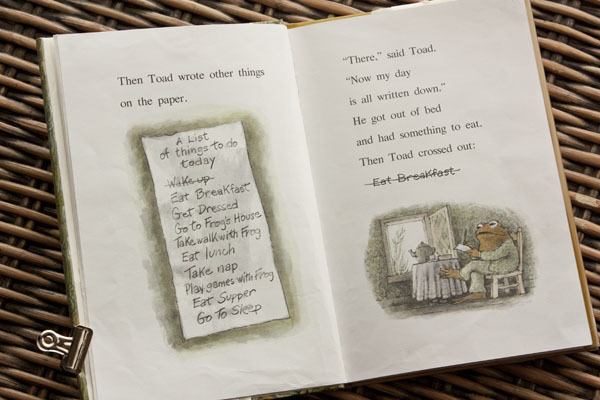 If you aren't familiar with this particular story, here is a quick synopsis: Toad wakes up and makes himself a list. As he finishes each item he crosses it off. Later, he is out on a walk with Frog and the wind blows his list away. He would chase after except (heaven forbid) that isn't on his list of things to do! So, he sits there for the rest of the day because he doesn't have his list to tell him what to do. Finally, it is getting late, so Frog suggests they should be getting some sleep. Toad exclaims "Go to sleep! That was the last thing on my list!" 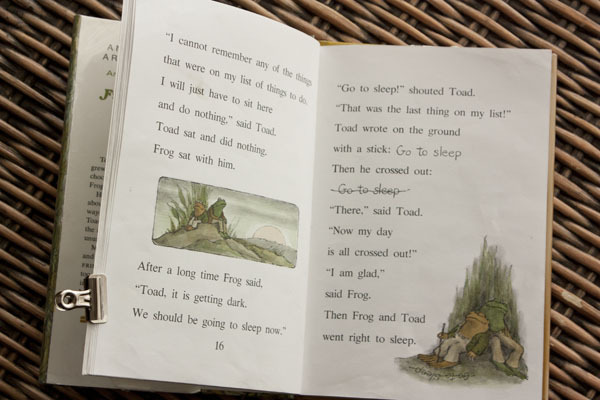 So he writes "Go to sleep" in the dirt, crosses it out, and then Frog and Toad promptly go to sleep. Right there. Without going home, eating supper, and going to bed. I love it. This was my mom's reply to my tweet a few days ago, and it is sound advice. My to-do list weighs on me because of the pressure I put on myself to have a perfect house, cook a perfect meal, be a perfect person... And you know what? Nobody cares that my wallpaper is peeling and I didn't have rolls to go with my dinner. (As long as there is a good dessert! Ha.) 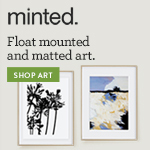 And it didn't matter if Frog & Toad did everything on the list. They were together enjoying each other's company. If there is one thing I've learned about being on the farm, its that having a structured schedule is impossible. We never eat at the same time and we never do the same things every day. Pile a baby on that and you never know what your day is going to look like. Some days I feel like I'm lucky if I cross one thing off my list. The notes application on my phone is probably my most-used app. I keep my to-do list there, my grocery list, a list of blog post ideas, movies to see, books to read, and it goes on. The other day I found a note with gibberish written in it and several of my important lists were deleted, including my grocery list. (Sarah!) It caused me some frustration, but life went on. Sometimes your list blows away. 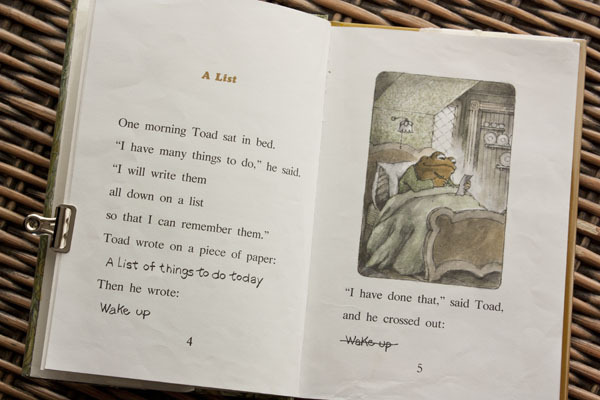 I love how Toad wrote "Wake Up" on his list after he had already woken up, just so he could cross it off. You know, there is a lot of satisfaction in crossing things off your list. Sometimes I forget to celebrate things I actually did get done, especially the everyday things like doing the dishes, feeding and playing with the baby, reading the girls a story, and laundry. (Laundry is always on the list!) One thing I have been trying to do lately is "pick three". I prioritize my list and focus on the top 3 things. It helps me to focus my time everyday instead of bouncing around trying to do too much and accomplishing nothing. This is the biggest lesson I want to learn—to stop stressing about what isn't done and just enjoy doing things. Sometimes I even let the fun things on my list stress me out. But if everything was done at once, what would I do with my life? What would I write about on my blog? (Ha ha.) Hard work is a privilege. Having a capable body and mind to do those things is a privilege. I want to learn to enjoy doing even the most mundane chores. So let's rename the to-do list, shall we? How about the Get-To-Do list? Or the Can-Do list?